Soo Bahk Do is our moo do, or martial art. The art , or Do , is a language of the spirit and body, therefore, moo do is our language of spirit and body through martial training. It s not what moo do is that s important, but how we express it that matters. Many practitioners believe Soo Bahk Do translates to hand strike way . This is an inaccurate translation and does little to describe our art by labeling it as merely a form of attack. Soo Bahk Do is not defined as a method to strike with the hands, rather Soo Bahk Do is a tool to strengthen our spiritual and physical language and improve overall personal well-being. Seal Script for Soo Bahk Do. Figure 1. The term Bahk has many meanings including to tangle, twist, turn over, pound, or change. An example would be a farmer turning over the soil which is a form of cultivating the earth. Another example would be a smith who works with metal by pounding and folding it to produce something of value. Every translation has one thing in common: Bahk is a term to improve or cultivate. The symbol on the left is the same symbol for Soo showing a human change. Just as a farmer and smith put forth tremendous effort and hard work to achieve the desired result, we as Moo Do In (Martial Art Practitioners) must give sincere effort as well. Physical cultivation will only come after intense physical conditioning as you pound, twist, and change your body. The same process is required for a spiritual change. Only after you are exposed to life s challenges and successfully overcome them by choosing the path of virtue can you achieve spiritual refinement. Do is an abstract term that is roughly translated as a spiritual way or path. The left side of the character signifies a road or path and the right side stands for head. Do can be expressed and observed through our actions. Our internal health relates to how we eat, sleep, and breathe. Training in both Moo Pahl Dan Kuhm and Moon Pahl Dan Kuhm (Standing and Sitting 8 Pieces Brocade) will improve the health of the internal organs through Ki-Kong breathing and an understanding of O-Haeng. Our internal health is closely coupled with O-Haeng, O-Ki, and the related 5 internal organs: Kidney, Liver, Heart, Lung, and Spleen. Regretably, few Moo Do In understand the relationships of O-Haeng, but is a vital component to the training of Nae-Kong (sincere internal effort). Our spirit, or ma ulm, relates to our heart or soul. It is not intellectual, but spiritual. Enhanced intellect is only beneficial as long as it is applied to cultivate one of these three distinct areas: Weh-Kong, Neh-Kong, or Shim-Kong. 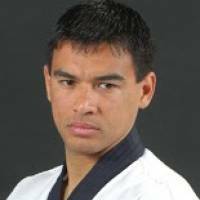 The value of the 8 Key Concepts, for example, is much more than a standard for improved martial technique. Courage, concentration, endurance, honesty, humility, and others are principles that need to be engraven in your ma ulm, and revealed in your every action both in and out of the do-jang. This is Shim-Kong (sincere spiritual effort) training. Kohn Kyung means sincere effort. In order to improve yourself in these three areas, it s important that you have sincere effort. Kong is another term that translates to effort and is the basis for the terms Shim-Kong, Nae-Kong, and Weh-Kong. Only by exercising sincere effort in cultivating the soul, breath and internal organs, and the physical body, will a Soo Bahk Do practitioner succeed in the purpose of Soo Bahk Do. Each of these is an important tool, or asset needed to be connected to the history, culture, and philosophy of Soo Bahk Do. 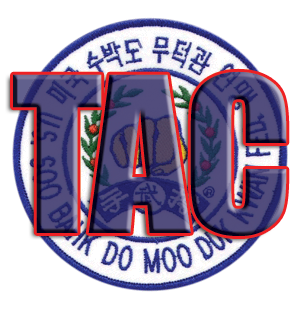 They are much more than mere lists or terms to memorize, but have great significance and application in your moo do training in and out of the dojang. If you cannot apply these principles in both your training and personal life, you cannot connect to the art. As the Song of Ship Sam Seh states: Failing to follow [these principles] attentively, you will sigh away your time. Calligraph for Do Jang. Figure 2. Even then, there was still a sense of do-jang, called do ryang, which is a Buddhist term. In Buddhism, outside of the main temple structure, there was a do ryang, or place of awakening. Traditionally, the monks would clean the dirt around the do ryang before they became monks. This was a way for them to clean their ma ulm and connect with the Buddha. The term do-jang comes after World War II where formal structures were erected called do-jang. Jang has two parts. The first is place and the second is change . Do-jang is the place to change your do or your ma ulm . See figure 2 for the calligraphy. It is the place to cultivate your soul and improve self well-being through sincere effort in Weh-Kong, Nae-Kong, and Shim-Kong training. It is not just a place to memorize your forms or learn new martial techniques. Both of these are additional tools used to improve the self. In the do-jang, we need to wear do-bok. Do-bok means wearing your soul (ma ulm). When we wear our do-bok in the do-jang, we are reminded that we are here to try and change and improve our ma ulm and that my ma ulm is visible to others through my actions. The way you put on your do-bok or the way you care for your do-bok will say much about your ma ulm. Moo Do Jaseh is a physical manifestation of your ma ulm. Therefore, the way you perform the moo do jaseh will determine how close you are to the art of Soo Bahk Do. The way you present a Chun Gul Jaseh, for example, is a manifestation of your ma ulm. Likewise, the way you wear your do bok will say a lot about who you are as a person. A dirty, wrinkled do bok will tell a different story than a clean, crisp one. Moo Do Jaseh is everything in our training including the way you tie your belt and the way you communicate with your juniors, seniors, and the general public. Moo Do Jaseh is manifested through your walk, your tone of voice, your words, and your actions. From a spiritual perspective, all ethical behavior is proper moo do jaseh and can be summarized by the term Duk Haeng Virtuous Action. Moo Do Jaseh should be made manifest in our every action. If this is the case, then every action will reflect our philosophy. As we practice and become accustomed to acting with proper Moo Do Jaseh, everything we do becomes ceremonious, not as a result of vain repetition, but as a result of sincere, consistent, and natural effort. Actions become ceremony as we tie our belt, ironing our do bok, clean the dojang, and help each other. When all of these things become ceremonial, you become more than a martial artist. You become an artisan of Soo Bahk Do. The art defines you and you contribute to the definition of the art. When you become an artisan, everything you do becomes a serenading stage, full of beauty. This is true mastery. Thank you Chang Sa Bom Nim, I truly enjoyed reading your article, it provided me with great spirit and energy. Soo Bahk! Ka Ham Sa Ham Ni Da, Chang Sa Bom Nim.